To celebrate Peppa Pig and Christmas our friends at Penguin have launched two new festive books; Peppa Goes Ice Skating and Peppa’s Christmas Wish and created some fabulous activities for you to print out – a great idea to keep any Peppa fan occupied while you write those Christmas cards or start that present wrapping. 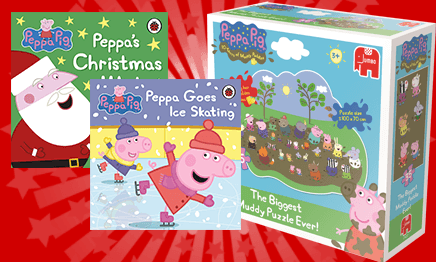 Download the activities sheets of “Peppa’s Christmas Wish” and “Peppa goes Ice Skating” and have a read about Peppa Pig’s festive adventures this Christmas. A great stocking filler idea at under a fiver. Peppa and George are going ice-skating but they have never been ice-skating before and Peppa keeps falling over. Mummy Pig teaches Peppa to skate and soon she has lots of fun. But when Peppa tries to teach George it turns out he is better than everyone!